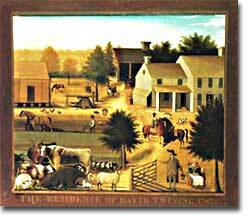 In his painting The Residence of David Twining, (1787) Edward Hicks portrays the farm of a prosperous Pennsylvania politician. While most yeomen did not have farms of this size and obvious wealth, the painting illustrates the American agrarian ideal — hard work, self-employment, and living close with nature will result in moral virtue and good citizenship. The Revolution succeeded for many reasons, but central to them was broad popular support for a social movement that opposed monarchy and the hereditary privilege. Diverse Americans rallied to the cause to create an independent American republic in which individuals would create a more equal government through talent and a strong commitment to the public good. Two groups of Americans most fully represented the independent ideal in this republican vision for the new nation: yeomen farmers and urban artisans. These two groups made up the overwhelming majority of the white male population, and they were the biggest beneficiaries of the American Revolution. Paul Revere's silver shop may have looked like this, with several apprentices and journeymen aiding master craftsmen in the varied and difficult labor of silversmithing. The yeomen farmer who owned his own modest farm and worked it primarily with family labor remains the embodiment of the ideal American: honest, virtuous, hardworking, and independent. These same values made yeomen farmers central to the republican vision of the new nation. Because family farmers didn't exploit large numbers of other laborers and because they owned their own property, they were seen as the best kinds of citizens to have political influence in a republic. While yeomen represented the largest number of white farmers in the Revolutionary Era, artisans were a leading urban group making up at least half the total population of seacoast cities. Artisans were skilled workers drawn from all levels of society from poor shoemakers and tailors to elite metal workers. The silversmith Paul Revere is the best- known artisan of the Revolution, and exemplifies an important quality of artisans — they had contact with a broad range of urban society. These connections helped place artisans at the center of the Revolutionary movement and it is not surprising that the origins of the Revolution can largely be located in urban centers like Boston, New York, and Philadelphia, where artisans were numerous. Like yeomen farmers, artisans also saw themselves as central figures in a republican order where their physical skill and knowledge of a specialized craft provided them with the personal independence and hard-working virtue to be good citizens. Not only was Paul Revere a leading patriot in Massachusetts, he was one of the most well-known silversmiths of the time. The representatives elected to the new republican state governments during the Revolution reflected the dramatic rise in importance of independent yeomen and artisans. A comparison of the legislatures in six colonies (New York, New Hampshire, New Jersey, Maryland, Virginia, and South Carolina) before the war reveals that 85 percent of the assemblymen were very wealthy, but by war's end in 1784, yeomen and artisans of moderate wealth made up the majority (62 percent) of elected officials in the three northern states, while they formed a significant minority (30 percent) in the southern states. The Revolution's greatest achievement, and it was a major change, was the expansion of formal politics to include independent workingmen of modest wealth. Head off to Boston to visit the home of one of the Revolution's most "revered" figures. 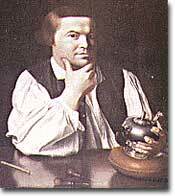 In addition to his famous midnight ride, Paul Revere was also an accomplished silversmith. This page is loaded with pictures of Paul, his home, and his metal creations and it doesn't skimp on the text, either. 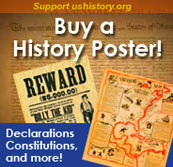 The Colonial Williamsburg Foundation brings you this excellent resource on all aspects of colonial life. You can meet the people, see the places, and learn the trades that defined the experience of a colonist. A dateline is included to help you sort it all out, and don't miss the section on tools of the era for a sense of how goods were created back then. Shirley Pewter is a company based in Williamsburg, Virginia that specializes in hand-made pewter goods such as mugs, vases, candlesticks, and more. So what exactly is pewter? Visit the company's website for a better understanding of this metal and its uses. Learn of the development of uniquely American pewter crafting between 1750 and 1850, and have a look some lovely finished pieces. North America's oldest continuously published periodical has entered the digital age with this comprehensive and eye-catching website. Since 1792, the Old Farmer's Almanac has been helping folks and farmers in particular with weather info, sunrise and sunset times, gardening tips, and tons more! Drop in, learn a little about life on the farm, and try to figure out their puzzle of the day! How did 18th century yeoman farms become 20th century factory farms? Has the agrarian ideal succumbed to the "agribusiness corporation"? Have a look at what the United States Information Agency has to say! This site traces the transformation of family farming in the early years of the nation into modern "agribusiness", though its main focus is the 20th century.